The other day while online shopping with a gal pal, we came across Nine West site. It had been a while since I purchased from Nine West but from my recollection a gal could definitely find cute pieces from time to time. 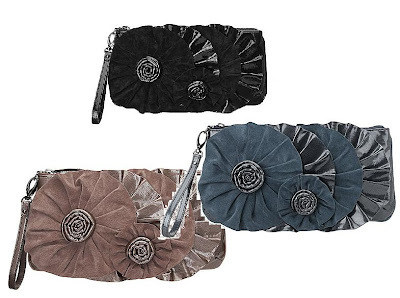 Anyhoo, as I am a girlie girl, I sorta like this floral detail clutch with removable wristlet. Looking at the image, I believe material is manmade leather but who cares, aren't they cute? Each is only $79, how savvy is that! With me wearing so much denim, the blue one will be so adorable for fall. What do you think? The style is on preorder with shipping date of 9/15/09. They're awesome! Girly but not too girly. Hi there-oh yes, they're gorgeous I love the blue one too! Love it! I have something kind of like that from Target a few years ago from one of the guest designers (terrible that I can't remember which one!). Soooo cute! Can't wait to see yours! I like that. Hope you've been having a great weekend. Those are adorable. I'm always surprised by Nine West. They really do have nice items and the quality is pretty good too. I've been seeing a lot more purses with ruffles, recently, and I love them! I love it! savvy price indeed! ps: gave you an award! These are so pretty! I especially love the muted colors and the rosettes! those floral clutch so cute Savvy...i love the blue one too. that blue clutch will be adorable for fall. and the price not too expensive. Very cute! I like the blue one as well. However, to mix it up with all that denim, i'd go for the taupe/beige one. I saw that clutch in an ad in Vogue and thought it was so adorable! Cute clutches! I love the floral design.